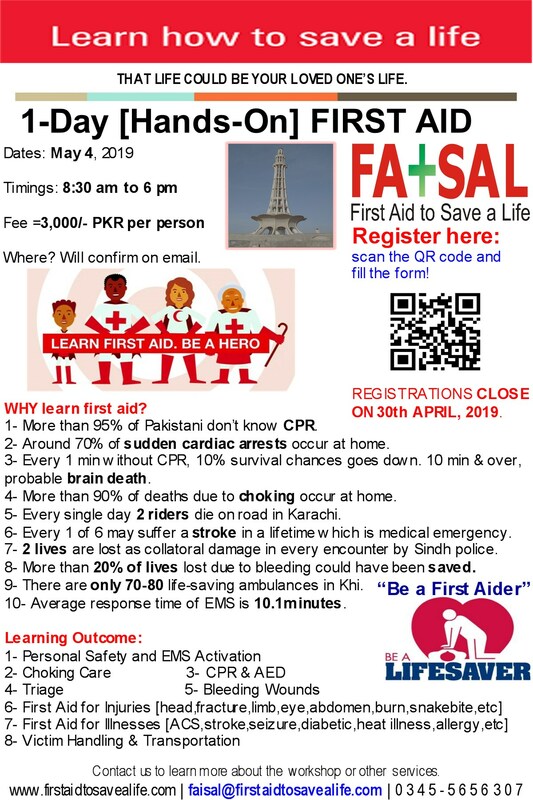 First Aid to Save a Life (FATSAL) Pakistan is pleased to announce their upcoming workshop on “First Aid, CPR and AED” on May 5, 2012 at Railway Hospital, Rawalpindi. FATSAL in collaboration with Ronaq-e-Qainaat has planned this full day workshop. Please see below for more details and registration. This entry was posted in Workshops and tagged aed workshops, cpr workshops, fatsal and ronaq-e-qainaat, first aid cpr and aed workshop, first aid workshops, medical workshops, railway hospital rawalpindi, ronaq-e-qainaat, workshop at railway hospital rawalpindi, workshops. Bookmark the permalink.